Hello everyone! Can you believe Halloween is right around the corner? Time to get ready, and I have the perfect little decoration AND treat for your office or stamping space and it is SO super easy to do. Whether you eat the treat or not, you can't deny how DE-lish all those yummy goodies look in the little jar, now can you? I think this cute little "smoothie" looks so cute sitting on my desk and boy are my kids going to be begging for all this sugar all day, every day. Hopefully my friendly little spider will keep them away, ha! I'm using paper, ribbon, and brads from the Halloween Key Ingredients Kit as well as the set, Spooky Expressions. I stamped the images in Memento Tuxedo Black ink and colored them with Copic Markers. Nex t, I used circle and circle scallop Nestabilities to cut the images out and layered them on coordinating card stock. I dabbed some Stardust Stickles on the witch's boots because I thought she would like to have some sparkly shoes, since Dorothy ran off with the red ones... 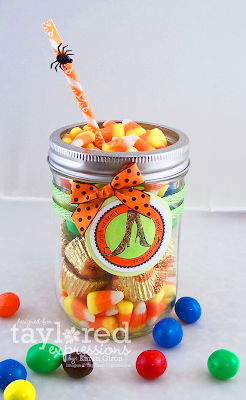 Putting the jar items together is a snap - just find fun candies to layer on top of each other in the jar and add the Pixie Stick "straw" to finish the look. Taylor is hosting the October 20th Key Ingredients Challenge at her blog along with some of the Baker's Dozen. 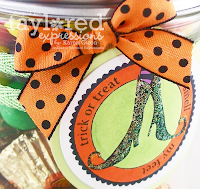 Hop on over to Taylor's blog to see all the details, to play along, and catch a peek of this month's KI kit. Have you signed up for the Taylored Expressions newsletter? You'll get the latest specials, news, and ideas delivered right into your inbox. Head on over to the Taylored Expressions homepage and sign up on the left sidebar. Just a reminder, please "drink" your Halloween Smoothie responsibly so you don't go into a sugar coma - LOL! Have a wonderful day. Now THIS is my kinda smoothie!!!!! LOVE it!!!! What a great idea! I love this. This is TOTALLY awesome girlie! DELISH to the max!!! What an adorable little smoothie, Karen! I LOVE it!